A boar stud operation on the Kansas/Nebraska border, which recently added a sophisticated geothermal (heating and cooling) system to keep boars at a consistently comfortable body temperature, has also recently completed a major installation of a solar energy system. 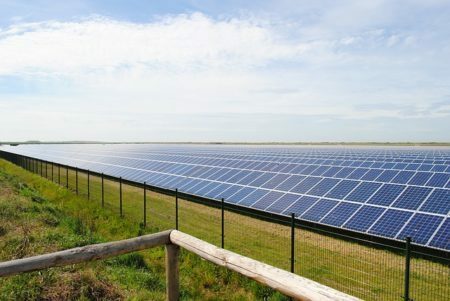 Zoltenko Farms near Hardy, Neb., which was founded just over 100 years ago in 1917, will showcase their new 1,164-solar paneled system to the community during their Solar Power Open House at the Zoltenko Farms site on April 21 from 1:30 to 2:30 p.m. Click here for additional details. Amy Hadachek is a freelance writer who lives on a farm with her husband in north central Kansas and is also a meteorologist and storm chaser. She can be reached at: rotatingstorm2004@yahoo.com. Founded in 1916, American AgCredit is part of the nationwide Farm Credit System, specializing in providing financial services to agricultural and rural customers throughout California, Nevada, Kansas, Oklahoma, Colorado, and New Mexico – as well as to capital markets customers throughout the country. Farm Credit Services of America, based in Omaha, Nebraska, is also a part of the Farm Credit System, serving the financing needs of agricultural producers, agribusinesses and rural homeowners in Iowa, Nebraska, South Dakota and Wyoming. The Farm Credit System is a nationwide agricultural network providing credit and affiliated services to farm and ranch operators across the United States. See a list of participating associations here. Leasing Remains Effective Tool Under New Tax Laws, AgDirect, an equipment financing program offered by participating Farm Credit associations. This entry was posted in Financing, Nebraska / Midwest News, Solar Energy Education and tagged American AgCredit, Farm Credit Services of America, Farm Credit System, farm energy, farm tours, IRS Section 179 Depreciation Updates, Midwest farms & ranches using solar energy, Nebraskans for Solar News/Blog, solar energy incentives, solar equipment leasing, Zoltenko Farms on April 14, 2018 by Helen Deffenbacher.